Does a low number of home staters mean everyone has left? Last week I took a look at the share of US born residents in each state born in their current state of residence. Some on other blogs wondered if a low share of native born in a state meant that everyone has left or if instead that state is a big lure to out-of-staters. Aside from a few outliers, it seems to be the latter. Take a look at this quick analysis: states with a low share of native born tend to have high net inmigration and states with many born in state tend to have high outmigration. It makes sense that in tougher times (evidenced by net outmigration) those with deeper roots find a reason to stick around - or maybe they are just tied down. High net inmigration, low native born states tend to be high in natural amenities (read: mountains) or recent boom states in the west - many of which may have capitalized on the exodus from California. Note that North and South Carolina, Georgia, and Tennessee have similar numbers. 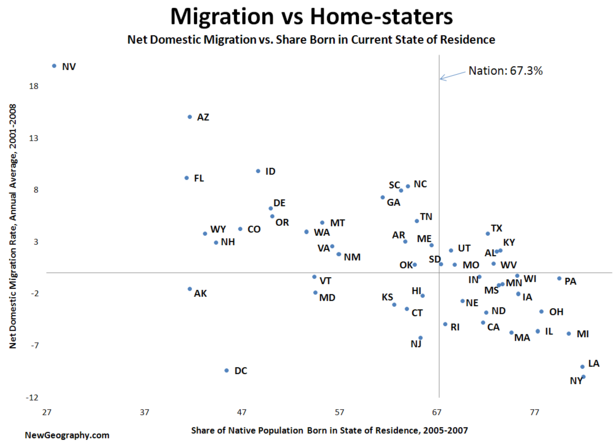 Most interesting is the grouping towards the upper right: states with both above average number of those born in state and positive or near positive migration. Could this signal a return of the diaspora to states like Texas, Kentucky, Alabama, Utah, or even Wisconsin and Pennsylvania?